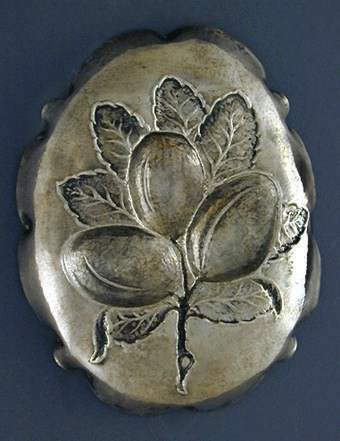 similar sweetmeat dishes were made in Germany in 17th and 18th century, all with a pair of lobate scroll handles. 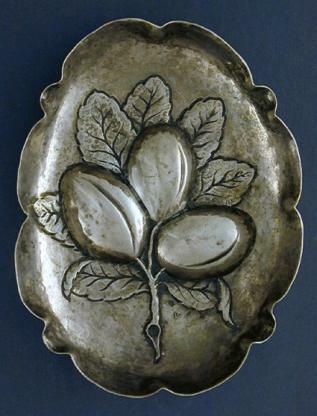 This octafoil shaped silver dish has center embossed with fruits and leaves (maybe plums) and has no handle. 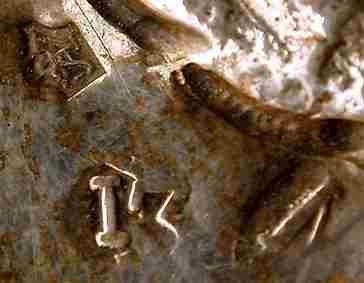 It is hallmarked with "13" (purity degree in loth), N (probably for Nuremberg) and has later Austro-Hungarian importation mark (1901-1921). 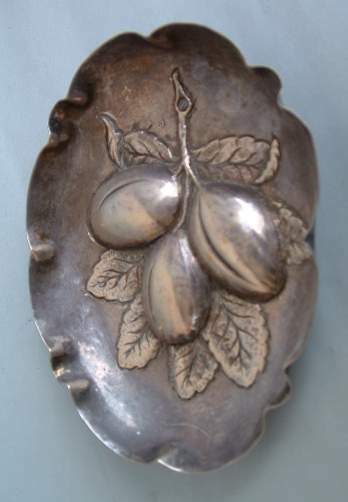 This dish was probably made between end 18th/beginning 19th century but I suspect that these are pseudo-hallmarks used in Hanau (Germany) in the last quarter of 19th century. The dish is 4 3/4 in. (cm. 12) long and was bought from an Austrian dealer through the Internet.